Muirfield's Membership: Savage Brand Of Self-Satire? A majority of members have voted in favor of allowing females to join. But as Hyde recounts, the holdouts, who have prevented the move from occurring and Muirfield to rejoin the Open rota, are viewed...lightly. On club membership, I am an unapologetic Marxist (Groucho, not Karl), and since the R&A have rightly removed Muirfield from the Open rota, this spectacle has become much more self-harming than anything else. Indeed, the good gentlemen of Muirfield should be under absolutely no illusion: watching their twice-yearly insistence on making pillocks of themselves is a hundred times more entertaining sport than anything that could be viewed on their course. If they feel they must persist in this particularly savage brand of self-satire, then it is not for us to impede their journey. “Every time we watch the replay of the telecast, it brings out the same emotions and highs and lows that we experienced..."
Karen Crouse does a nice job getting Jim "Bones" Mackay to talk about last year's epic Phil Mickelson win at Muirfield and the rare emotions it evoked from the longtime Mickelson looper. Mackay’s clear head complements Mickelson’s unconcealed heart, but when Mickelson made a curling, left-to-right 10-footer for birdie at the final hole, Mackay was the one who lost it. He was overcome by emotion seeing Mickelson succeed on a stage where he had failed so many times. It moved him beyond words to see all the time Mickelson had spent developing a cut drive to counteract the wind pay off on such a grand stage. The depth of Mackay’s fondness for Mickelson was revealed in a pool of tears that could have filled the claret jug. For one day, anyway, there was no taking for granted one of the most stable relationships in sports. Mickelson returned the jug Monday at Royal Liverpool to R&A Chief Executive Peter Dawson and a miraculously situated sponsor's vehicle that happened to make some of the frames. Steve DiMeglio reports on Mickelson's return and his upbeat mood Monday as he prepares to defend. Jim McCabe files a super recounting of last year and Mickelson's return as defending champion. There was this about the jug getting used as a decanter for some nice wine, which ended up being the big takeaway from his presser. Pushed to disclose what has been used to celebrate these toasts, Mickelson smiled. Treating the Claret Jug with reverence, he said, is to realize only the finest quality tastes can be used and one of his friends offered up a 1990 Domaine de la Romanee-Conti. Given that a bottle of Romanee-Conti could set you back anywhere from $20,000 and $40,000, it’s safe to assume the French wine was very good, so it will remain another vivid memory of his year of supreme satisfaction. Video And Poll: Who Is Your 2013 World Player Of The Year? One of the nice annual touches from the R&A is their forensic analysis of rulings at The Open Championship, now posted on their website. Right off the bat there was this stark reminder about the difference between the '12 and '13 Opens. There were 234 rulings at the 2013 Open, which compares with 339 in 2012 at Lytham where a large number of rulings were given due to casual water on the course caused by the very wet summer. Rulings recounted from 2013 include Thomas Bjorn hitting a camera with his shot from the rough (with nice clear video! ), Charl Schwartzel breaking his club (no video, but that's why we have archives!) and Hideki Matsuyama's slow play penalty. Matsuyama was then given a second bad time for his second shot to the 17th hole. Given his tee shot had gone in to the crowd and considering the difficulty of the shot, Matsuyama was given additional time to deal with the crowd and to go forward to assess his shot. The timing for the shot therefore only started when the player had returned to his ball; however he then took a further 2 minutes 12 seconds to play the shot. That second bad time resulted in a one shot penalty being applied to Matsuyama’s score on the 17th hole which became 6. Thanks to readers David and Tommy for the tip of the entire BBC final round broadcast of the 2013 Open Championship posted on YouTube. Also, at the 4:52:09 I just love that person handing Phil a Rustic Canyon bucket cap to sign. Thanks reader David for spotting that! As he's done with Adam Scott at the Masters, Michael David Murphy has put together a supercut of all available Phil Mickelson swings from the 2013 Open Championship final round 66. Here I wake up thinking, "my God what did I post last night after that second glass of wine," while Phil Mickelson reveals that he woke up U.S. Open Sunday thinking he'd already won the national championship. CPA K. Sean Packard, CPA "specializes in tax planning and the preparation of tax returns for pro athletes" and has broken down Phil Mickelson's winnings in Scotland from the last two weeks: His conclusion, well, Phil netted very little in actual on course earnings after the Queen gets her take to pay for George's diapers and California pays four teachers. Seriously, this is an important topic as it relates to getting top players to play the Scottish Open, BMW at Wentworth or an English Open if it could ever be made to happen. Players simply avoid playing in the UK more than they need to because of the stifling tax rates on top of what they pay here at home. First world problems, indeed, but nonetheless important for everyone (myself included) to remember when we lament why more players don't play Royal Aberdeen next year, or why the PGA Tour does not play a WGC event in the UK or why we don't see more tournaments on the great links of the U.K.
For his two weeks of play, the world’s best golfer (rankings be damned) earned £1,445,000, or about $2,167,500. The United Kingdom, which has authority to set Scotland’s tax rate until 2016, graduates to a 40% tax rate when income hits £32,010 then 45% when it reaches £150,000. Mickelson will pay £636,069 ($954,000, or 44.02%) on his Scottish earnings. But that’s not all. The UK will tax a portion of his endorsement income for the two weeks he was in Scotland. It will also tax any bonuses he receives for winning these tournaments as well as a portion of the ranking bonuses he will receive at the end of the year, all at 45%. It is a significant amount for Mickelson, with only Roger Federer and Tiger Woods earning more among athletes from endorsements and appearances. Without considering expenses, Mickelson will pay 61.12% taxes on his winnings, bringing his net take-home winnings to about $842,700. When expenses are considered (10% to caddy Jim “Bones” Mackay, airfare, hotel, meals, agent fees on endorsement income/bonuses—all tax deductible here and in the UK), his take-home will fall closer to 30%. Of course Phil will benefit in the endorsement world and, oh yeah, he's the Champion Golfer of the Year having won The Open at Muirfield, over a star-studded leaderboard with a round that will talked about for ages. No tax bill can take away that. GolfChannel.com has a nice roundup of quotes from Phil Mickelson making the media rounds, including his admission that he was so tired and beaten down from the U.S. Open loss that he didn't get out of bed much until a family trip and a dinosaur egg got him going again. Finally, Phil hit the Today Show to talk about his Mickelson ExxonMobil teachers academy and to play table tennis. **Thanks to Average Golfer for spotting Phil's appearance on NPR, too. Golf World On Tiger's Open: "Wrong And Gone"
I had the task of following Tiger and Adam Scott Sunday at the Open Championship and here is my Golf World take on Tiger's final day. Left quietly said in the wake of Phil Mickelson's Open Championship win was his decision to go without a driver. Scott McDermott and Euan McLean slam R&A Chief Inspector Executive Peter Dawson for not holding his annual State of the Open press conference and speculate that despite a mostly outstanding week of golf and operational excellence, he was not interested in answering any more membership related questions. 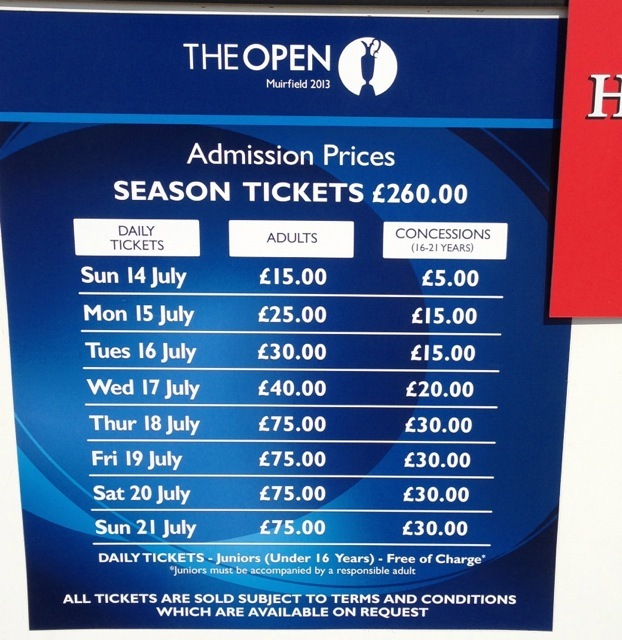 However the R&A did offer a reason on the attendance drop at Muirfield compared to the last Open held, there, which was particularly noticeable Thursday and Friday. The statement read: “More than 142,000 people attended The Open this week. That is almost 90 per cent of the figure in 2002 and we are pleased with this attendance. Extreme warm weathering meaning the temperature approached 80 for a few hours! More likely the drop was related to high ticket prices and the elimination of a senior discount. To kick off Light Posting/Celebrating East Lothian Golf Week, I’d like to direct you to a story I wrote for the July 2013 Golf Digest on making your golf pilgrimage to Edinburgh and East Lothian. Nothing against St. Andrews, which is terrific, but if you love the history of the game, want to make the essential trip for a golfer and want to take a trip to Scotland without the long drives and travel stress, this is the place to set up shop. Having spent another week here playing some golf, seen the courses in their perfect dry state, experienced more of the eateries, hung out in Edinburgh and settled into the towns of North Berwick and Gullane as a guest, I’m even more confident in my reporting from a year ago that this is a golfing mecca like no other. To put it another way, I had that uniquely bittersweet emotion of driving through Gullane today, happily seeing life getting back to normal for the town but so desperately hoping I will get to come back and do it all over again. As I outline in the story there are so many places to see and while I should start with the most historic locations in Edinburgh, in honor of today’s Tuesday racing card at Musselburgh Race Course, I’d like to direct you to videos I posted previous on the site from one of my favorite days in golf: morning play at the oldest played course in the world (with hickories), and afternoon of racing. Where the turf meets the turf. And of course, should you decide to make this journey, GolfEastLothian.com is a super one-stop-shop for most questions, planning help and even tee times at some courses. Enjoy and may all the horses come home safe! With many of the sport’s biggest names in contention, ESPN’s live telecasts of the weekend rounds of play in The Open Championship on Saturday and Sunday, July 20-21, set cable viewership records for golf’s oldest major championship. ESPN’s digital platforms also saw double and triple-digit increases during the event. According to Nielsen Fast National data, ESPN earned a record-tying 3.1 U.S. rating for the 8 a.m. – 1:30 p.m. ET live telecast of Sunday’s final round as fan favorite Phil Mickelson scored a come-from-behind win at Scotland’s Muirfield Golf Links. The telecast, which averaged 4,372,000 viewers, tied the ratings record set in last year’s final round for the highest-rated cable telecast of the event and set a cable viewership record for the event, eclipsing last year’s mark of 4,227,000. The 9 a.m. – 2:47 p.m. Saturday telecast earned a 2.7 U.S. household rating, averaging 3,776,000 viewers, beating the 2.6 U.S. rating and 3,545,000 viewership average ESPN earned for third-round coverage in 2012. It ranks as cable’s highest-rated and most-viewed telecast of the third round. Sunday’s telecast ranks third-highest among all golf telecasts on cable, only behind the 2008 U.S. Open playoff and the 2010 Masters first round (when Tiger Woods returned to golf). The Saturday telecast ranks ninth. ESPN golf telecasts hold nine of the top 10 positions, including all of the top five. ESPN’s telecast of the opening round on Thursday also attracted more viewers than last year, with the 7 a.m. – 3:45 p.m. telecast averaging 1,398,000 viewers, up from an average of 1,343,000 last year, with both telecasts earning a 1.1 U.S. rating. Friday’s 7 a.m. – 3:39 p.m. coverage was down slightly from last year, earning a 1.3 rating with an average of 1,658,000 viewers, down from a 1.4 rating and 1,771,000 viewers last year. Saturday’s encore presentation airing on ABC from 3-6 p.m. was up in metered market ratings, earning a 1.4, up from a 1.3 last year. Sunday’s presentation earned a 1.6 metered market rating, the same as last year. The Open Championship (July 18-21) across ESPN digital platforms – including ESPN.com, Fantasy, the ESPN mobile Web, ScoreCenter and WatchESPN – logged an average minute audience of 95,831. Specifically on ESPN.com, the Golf section logged an average of 890,000 daily unique visitors (up 22 percent) and an average of 9.3 million minutes per day (up 65 percent). On mobile, the Golf section on the mobile Web averaged 7.6 million minutes per day during the championship (up 32 percent), while the Golf section on the ScoreCenter app averaged 413,000 daily unique visitors (up 107 percent) with an average of 2 million minutes per day (up 105 percent). Additionally, The Open Championship on WatchESPN and ESPN3 generated 74.8 million total minutes throughout the event, up 21 percent compared to last year. It will be Light Posting Week here as I take a few days of holiday, but there will still be some news, notes and commentary worth highlighting in the wake of Phil Mickelson’s stirring Open Championship win. Karma, preparation, experience and incredible skill on a fiery links added up to a historic win by Phil Mickelson, who captures his fifh major and is a U.S. Open away from the career Grand Slam. He appropriately joins a list of superstar winners at Muirfield and put away a leaderboard for the ages. It's hard to image a more impressive win and validation of both Mickelson's career along with Muirfield as a venue. Sunday is noticeably cooler and the overcast more stubborn, with the same easterly winds we've seen since Friday. Whether the hole locations are more accessible--well, not placed on humps and bumps--remains to be seen but with a stellar leaderboard we should be in for a doozy. I'll be trailing the Woods and Scott group from the moment they hit the range but will be following on Twitter and via The Open's Lee Westwood Radio Network (87.7 on the dial if you are in Scotland). Previewing the finale, Jim Moriarty thinks Lee Westwood has a shot at breaking his 0-61 record in majors. For a UK take, James Corrigan and Kevin Garside understandably feel it's Westwood's chance and and based on post round comments, the Englishman is certainly sounding confident. I wrote in Golf World Daily about Tiger's decision not to lay-up on 17 yesterday and how his refusal to play driver there could be key to today's finale. Bob Harig breaks down what's at stake for the various leaders and their chances of winning. In the polling here, after nearly 900 votes, Tiger is your pick at 37%, Lee at 29% and Adam at 14%. Oddschecker turns into exchange wagering Sunday and might make for fun viewing. The Guardian's live final round blog for those of you unable to watch, or if you are on Twitter, ByTheMinuteGolf will be joined by Mike Clayton and Lloyd Cole today. Kevin Murray with the strange saga of Martin Laird not speaking loudly enough for his playing competitor or referree to hear him tough his ball to identify it in the 10th hole rough. On the par-four 10th, he found the rough twice in succession and, on the second occasion, did not tell playing partner Dustin Johnson or the referee he was going to touch his ball to identify it. Laird is adamant he told the ball-spotter, but that is not enough under the rules. He said: "If I had said, 'Dustin, just went down to find my ball,' or, 'Rules official, I'm going to identify my ball', loud enough for one of them to hear, it would have been fine. "It's the fact that none of them heard it, even though I said it. "A spotter said to me, 'There's a ball here. I'm not sure if it's yours'. "I said, 'I'm going to identify it'. I put the tee in the ground [to mark it] and didn't even lift my ball, just moved it a quarter roll to see the number. "At the time I was thinking more about the golf shot I had coming up than about the ruling. It's one of those lovely rules of golf." Q. Can you explain what happened? DAVID RICKMAN: Well, I believe he maybe said it to the ball spotter, who was in closest vicinity. But the rule is very specific. It needs to be the fellow competitor, the fellow competitor is there to protect the interests of the rest of the field, and therefore, we are specific about who that needs to be. Because you need to give that fellow competitor, or as I say this week, the referee, the opportunity to come over and observe the player's actions. That's the protection that the rule gives. DAVID RICKMAN: The ball spotter saw that this was happening. The referee also saw a tee, on this occasion, a tee coming up and down, and that, of itself, indicated that perhaps there had been more than just the parting of the grass, I'm afraid. DAVID RICKMAN: I don't believe it was a spectator, no.